One of the most costly and efficiency reducing problems facing owners of absorption chillers is Lithium Bromide caused corrosion. Surprisingly, not much is done to combat this destruction and waste. This is because the absorption system is highly chemically oriented, and most mechanical engineers and service mechanics simply do not have the specialized training required to handle chemical problems. Richard S. Levine and LBD ASSOCIATES understand Lithium Bromide caused corrosion in absorption chillers and how to control it. As a corrosion control chemist with 30 years experience, Mr. Levine can help solve your costly absorber chemical problems and help your chiller perform better and last longer. Lithium Bromide and water constitute the working fluids in the absorption chiller. Water is flash boiled at low pressures to produce cooling, and the Lithium Bromide brine absorbs the resulting water vapor returning it back to its original liquid state. But, inside the chiller, Lithium Bromide is highly corrosive attacking internal metallic surfaces. Lithium Bromide is a brine like Sodium or Calcium Chlorides. All brines are extremely reactive and will attack most ferrous (iron) metals. When Oxygen is introduced into the absorption system via an air leak, chemical addition or tube failure, the corrosion begins. The Oxygen forms a cathodic reaction scavenging free electrons which are produced when any metal corrodes. This perpetuates the corrosion sequence until either there is no longer any metal left to dissolve or any Oxygen present to consume electrons. There are two basic metals found inside any absorption chiller. They are copper and iron. The copper is the major component of the tubes, and the iron comprises the mild steel shell of the unit. Both are affected by the Oxygen attack, but not in the same manner. As oxygen attacks mild steel, the reaction is most efficient at low pH values and low solution alkalinities. Increasing these chemical parameters will reduce the attack on mild steel. Copper, on the other hand, corrodes readily as these chemistries increase. Hence, to protect one metal of the absorption system, the other will be correspondingly sacrificed. An early attempt to solve the Lithium Bromide corrosion problem was to raise the solution alkalinity. Neutral Lithium Bromide brine at 54% has a very low solution alkalinity and is correspondingly very aggressive towards mild steel. The earliest absorbers were, thus, attacked by the brine acting mainly on their internal steel hulls. This attack produced non-condensable Hydrogen gas, which in turn, raised the internal system pressure reducing operating efficiency of the chiller. By increasing the pH and alkalinity of the brine through the addition of Lithium Hydroxide, the mild steel attack was moderated thereby controlling the Hydrogen gas generation. However, the higher alkalinity concentration caused havoc with the copper portions of the absorption chiller. This led to rapid deterioration of the copper tube bundles, plating of internal shell surfaces and pump impellers, clogging of spray header nozzles, etc. The next evolutionary step in Lithium Bromide chemistry was to "engineer" a corrosion trade-off. Lower solution alkalinity would protect the copper, and an inhibitor would be introduced to protect the mild steel. Lithium Nitrate was chosen as the first inhibitor to be added to Lithium Bromide. Nitrates have been used for years as inhibitors for the embrittlement of mild steel caused by free Hydrogen in boilers. In many respects, the interiors of absorption chillers resemble those of boilers. Hence, nitrate was added at a reduced solution alkalinity level. The nitrate consumed the free Hydrogen as it was being generated by the mild steel corrosion thereby controlling the non-condensable problem, and at the lower alkalinity level, the copper corrosion was likewise reduced. Note that in this scenario, the chemical problems were not eliminated. Rather, they were merely masked so that the naturally occurring corrosion would no longer interfere with the operation of the absorption chiller. But, the introduction of Nitrate had two major disadvantages. First, Nitrate reacts with Hydrogen to form Ammonia and secondly, Nitrate is a powerful oxidizer by itself which means that it can increase the rate of many chemical reactions just like Oxygen. Ammonia aggressively attacks copper and its alloys. It is also an essential ingredient necessary for copper stress corrosion cracking to occur. Stress corrosion failures of copper tubes occur when both conditions of external mechanical stress and a corroding species are present simultaneously. These failures appear as long, hairline, fractures which run along the axis of the tubing. The Ammonia weakens the grain boundaries of the copper atoms and the stress "pulls" the grains apart. The tube literally falls apart. The oxidizing effect of the Nitrate increased the formation of black, magnetic iron oxide. 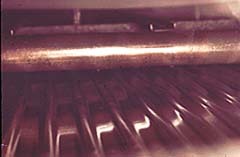 This fine, silt-like material is so prevalent in Nitrate inhibited absorption chillers that it accumulates to the point where it ultimately fouls spray nozzles, heat exchangers and other fine crevices inside the chiller. Thus, the end result of adding Nitrate to the Lithium Bromide charge was to create a more complex chemical environment. While the short-term benefit realized by scavenging the free Hydrogen was achieved, the net effect was to clog working components and introduce the potential for stress corrosion failures. The first research published on Lithium Bromide corrosion and the use of various chemical inhibitors was performed in the early 1960’s. It led to the introduction of Lithium Chromate coupled with very low solution alkalinity levels as the corrosion scheme of choice. The result was very favorable compared to using Nitrate. Chromate is an excellent corrosion inhibitor for iron systems. It has been used since the 1920’s in boilers, cooling towers, and a vast number of other mechanical systems where iron components required protection from powerful corrodents such as Lithium Bromide. However, under certain conditions it can be harmful to steel and to copper. At very low concentrations, Chromate can cause pitting in steel. Pits are intense localized forms of extreme corrosion. They can lead to situations where the damage, while confined to a specific point, is so intense that failures occur. Furthermore, combined with high solution alkalinities, Chromate can produce an extremely rapid corrosion of copper and its alloys. The only answer is the precise chemical balance of the Chromate and alkalinity in the Lithium Bromide system. Chromate protects the steel of absorption chillers very well. It does not pose the threat of copper stress corrosion cracking since it cannot chemically change into Ammonia. It stops the generation of Hydrogen gas at its source by "passivating" the mild steel. However, using Chromate requires a thorough understanding of Lithium Bromide chemistry in order to achieve the desired level of corrosion protection. This is where Richard S. Levine and LBD ASSOCIATES enters the picture. Utilizing modern analytical chemistry techniques, Mr. Levine can critically assess the chemical condition of any Lithium Bromide solution. Then, having made this assessment, he can adjust the Lithium Bromide chemistry for more positive corrosion control and better refrigeration. Mr. Levine has developed chemical procedures to internally clean absorption chillers removing the build up of corrosion debris. Then, the Lithium Bromide solution can be rendered less corrosive with the proper introduction of Lithium Chromate using the Chem-a-cool treatment program. What this means for the absorber is quite profound ultimately leading to better performance, longer equipment life and reduced operation and maintenance expenses. Chem-a-cool is Mr. Levine’s and LBD ASSOCIATES exclusive process which can be performed by normal maintenance and service personnel. As an example of the effectiveness of the Chem-a-cool process, Mr. Levine modified the Lithium Bromide chemistry in 60 absorption chillers at the University of Illinois in the early 1970’s. A June 16, 1999 article published in the Daily Illini (the school's newspaper), stated that "more than 83 percent of the steam chillers are at least 30 years old and are expected to fail within the next five years". Not bad for chillers (originally designed to last about 20 years) that were performing very poorly before Mr. Levine changed their internal chemistry. Click here to visit Richard S. Levine's entire Lithium Bromide website with more articles, features and technical information.